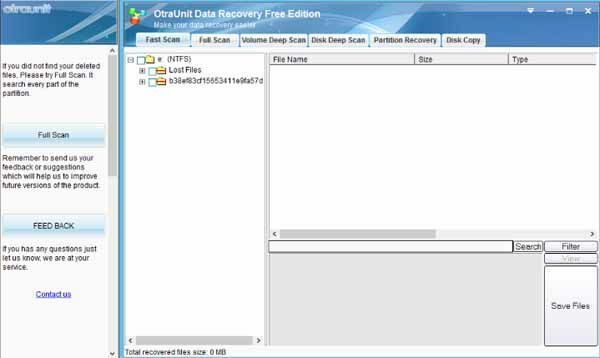 Free download OtraUnit Data Recovery latest version. It is a data recovery application software for your computer. OtraUnit Data Recovery is available free also for home use. It has the ability to detect your deleted or lost files from your specific hard drive. OtraUnit Data Recovery software is very easy to download and install. First of all, download the setup file from the download link given below. This is zip (compressed) file, so you may extract it first or directly open and run it. After running the file, it may asked to stop by your antivirus program such as Norton Antivirus. Anyhow, you can allow it but remember to install it on the drive that you do not want to recover. If you install in on a drive and try to recover the same drive, it may cause disk overwrite and permanent data loss. So be careful to use this program. After installation, it will start smoothly. You can select the “Fast Scan” option to check your drive for lost or deleted files. It will show you the result on the left sidebar. There are many other options that can be used such as Full Scan, Volume Deep Scan, Disk Deep Scan, Partition Recovery and Disk Copy. OtraUnit Data Recovery application allows you to recover large amount of files. This software supports various formats and you can store the recover files into specific location of your choice. It even allows you to save your recover files on another hard drive, different disk or even on flash USB Drive.